We present here a brief overview of the registry. Before 1500, mushrooms are seldom found in European art. 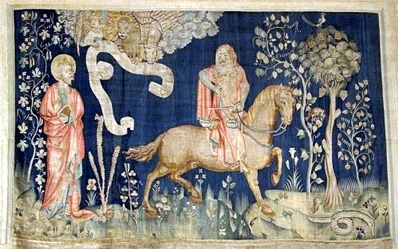 A rare example is seen in the panel "The Black Horse and Famine" in the Angers, France tapestries The Apocalypse. A small clump of of mushrooms is seen between the two rear legs of the horse. Mushrooms appeared in European art in significant numbers around 1500. Some early paintings depict bracket fungi (polypores) on decaying trees or as incidental specimens on the forest floor. An example is a painting by the German Hans Baldung Grien (1484/85-1545). His Three Ages of Man and Three Graces shows polypores (Fomes?) on dead tree on the left. The polypores add a somber touch to the lugubrious scene. Before leaving the Renaissance, see the playful painting by Giuseppe Arcimboldo (1527-1593). He made use of vegetables, fruits, and mushrooms to depict human heads. An example is his Autumn, which uses a gilled mushroom for his ear and two smaller ones for his eyes. The height of "Mushrooms in Art" was the Baroque period in the second half of the 17th century when still lifes became a very popular genre. Mushrooms can be frequently found in the company of vegetables and fruits. 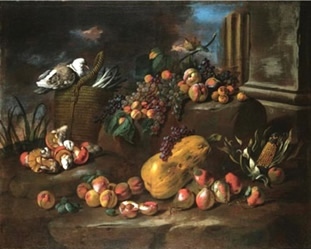 Such "kitchen" still lifes were most popular in Italy, where the paintings almost invariably depicted edible species, with Amanita caesarea and Boletus edulis far outpacing all others. We do not actually know the name of one of the most mushroom-prolific painters of this period. He is referred to as "Pseudo Fardella" or "Painter of Carlo Torre." Over half of the several hundred paintings attributed to this artist depict mushrooms. 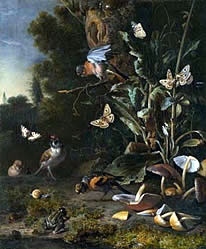 For another example of paintings of this period, see a painting by another Dutch, Melchior Hondecoeter's (1636-1695) Birds and Butterflies among Plants. The painter did not seem to want to "improve" on the natural scene and painted a realistic portrayal of the mushrooms. About 5 Hypholoma sp. are seen in right foreground. While the Italians were busy with "kitchen still lifes," the Dutch were producing a large number of "forest-floor still lifes," many with mushrooms in natural settings. One of the principal painters of this genre was Otto Marseus van Schrieck, sometimes considered to be the father of this naturalistic style. 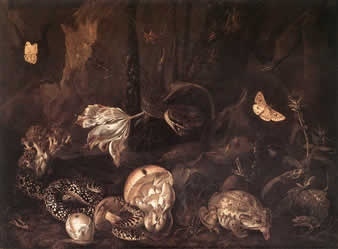 Van Schrieck often depicted several species of mushrooms in the same corner of the forest, together with snakes, lizard, toads, moths and other "dark" creatures. Painters of the 17th century often depicted food stalls and vendors, sometimes showing baskets of mushrooms. 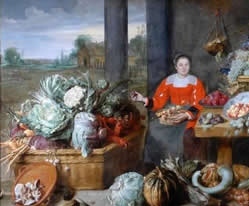 For one such scene, see a painting by the Flemish Frans Snyders (1579-1657), Fruit and Vegetable Stall. Fast forward to the 19th century to see a theme popular among Russian painters, a walk in the forest or people collecting mushrooms. An example is Ivan Ivanovitch Shishkin's (Schishkin, 1832-1898) Gathering Mushrooms. It depicts four women and a boy with baskets on clearing by a stream. No mushrooms are visible. Mushroom paintings can also be found in the Romantic period. 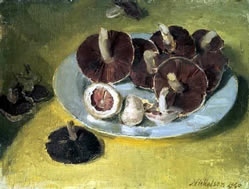 An example is Mushrooms by the British William Nicholson (1872-1949) that shows a plate of Agaricus campestris in various stages of maturity. The registry also includes selected contemporary works.